I have been wanting to switch up the living room for quite a while. I really, really, really, really, really times 10 to the 3rd power wanted to add in the color blue. The color of my blog...okay, that's not the reason...but don't you think it's nice for your blog to match your decor? Ha! Alas, our rug (which was lovely and in great shape) was all in warm shades of gold, red and brown. But then, as you may recall, the Princess was sick in the living room. Gross. But serendipitous in a way. We *had* to replace that rug, so for Christmas the hubby and I pooled our gift money and bought a new rug. Pretty and neutral. Then the fireworks began. With a new neutral rug, my decorating-obsessed self was free to make some switcheroos. I am lucky to have a hubby that loves decor *almost* as much as I do. He is really open to my suggestions of change. And very helpful as well. So when I told him I wanted to switch around the living room and add some blue...he was game. 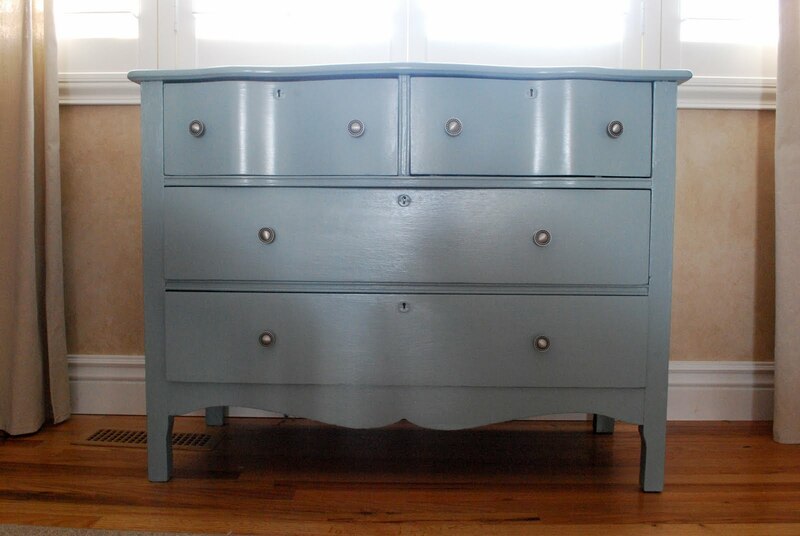 Enter this pretty little $25 dresser. Yep! $25. It was an aweful minty shade of green. (Doesn't look quite as minty or aweful in this photo.) But it had pretty lines. And, did I mention it was only $25?!? I told the hubby I wanted to put it in the living room...and I wanted it to be blue. He agreed. And even volunteered to do the painting since I am currently bogged down with other stuff. Here comes the tricky part. We wanted to find the perfect shade of blue. So I emailed this sweet lady who has a fabulous dresser in a delightful shade of blue. And off we went to Lowe's to get the paint. Alas, it was not quite the right shade for our decor. So we had them lighten it to 75%...brought it home...painted the dresser...still not right. Then I pulled out some pretty throw pillows we had in the master bedroom and asked the hubby if he thought their color might work. A nice grey-ish french blue. He loved it. So off we went to Lowe's again...pillow sham in hand... and found the perfect blue. Cafe blue by Valspar in semi-gloss. And the hubby (injured leg and all) painted the dresser yet again. We switched out the knobs for some fabulous clearance versions (again from Lowe's) and VOILA! The perfect addition to our living room makeover. Of course...when you add a blue dresser to the living room...you have to shift furniture...paint other furniture...switch up the accessories...switch the slipcover on the sofa...etc. etc. I'll show you all the rest of the changes just as soon as I figure out what to do with the curtains. They are in dire need of a little spruce up! But for now...I'm sure loving that blue dresser! I love that shade of blue! Great choice! This is yet another brilliant makeover and I'm loving Le Tour Eiffel to bits. Dear Wendy, years ago I've had this color and i like still. It's a color that looks very airy. Very pretty! It's funny how these things happen. Our family room got a mini overhaul after we received a new television for Christmas. Great revamp! Love the blue and love the tower as well - how perfect! Can't wait to see the rest of the changes! Ah, she's done you proud! Wonderful shade of blue, I've written it down in my day planner, love the dresser what a steal that was! Love the curvy dresser and that beautiful shade of blue - perfect! I'm also trying to incorporate more blue into my home. Beautiful. Great eye for the color. I have been looking for the right shade of blue for my home, I am writing this down so I don't forget. Thanks for sharing. LOVE it! Can't wait to see the rest of the changes!!! That's a GREAT dresser and a great shade of blue, too! I love that shade of blue. What a sweet husband you have! love, love, LOVE your dresser redo! that shade of blue is perfect! what a sweet hubby to help! hope he's feeling better. Wendy - that shade of blue is both adorable and timeless... you can't beat it! Don't even get me started on that precious little dresser. Totally worth more than the $25 you paid for it. Can't wait to see the living room! Nice choice! Love the curves on that dresser. We just injected our tired old living room with some blue as well. Our formerly pine armoire got painted blue. That led to painting the coffee table and adding some other accents. Still not finished...one thing leads to another! That dresser has such great lines. I lve the curves.And it has officialy become The Shabby Nest mascot. LOL! I too love the lines of that dresser..The color is beautiful..Can't wait to see what you come up with in your room.. I Love this color. What a beautiful piece of furniture. It fits perfect. Wonderful Job. it looks so pretty! i love the color! Ooh I love it! Such a pretty blue! I love it! The curves are beautiful. I am going through a bit of a blue period myself so I am anxious to see the reveal. How nice of your husband to help you out. my husband is also my design assistant/ laborer! Great job! Perfect blue. Love the lines of the dresser. I love dressers in living rooms. Practical, pretty, a bit unexpected and decidedly clever. Love your french blue. 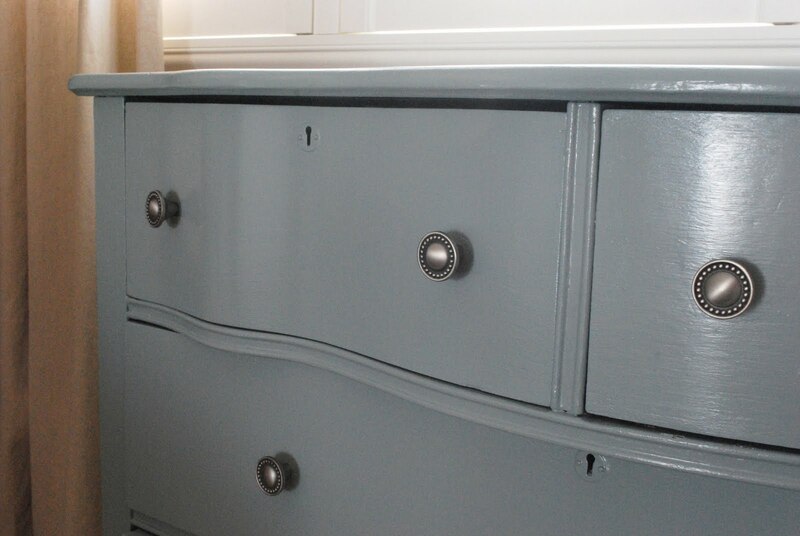 Love the dresser transformation the color and the knobs go so well together. It's not so fun finding just the right paint color through trial and error but the outcome is usually worth all that time and effort. BTW, I like your bangs. I cut bangs on my hair a few months ago and agree that it's so much fun to give your look a change like that once in awhile! Love it! I need something like it for my living room also!!! How did you paint it? Roll or brush? I like your blue/grey dresser. Finding the right color on the first go hardly ever happens for me....sorry it happened to you, but kinda glad to know I'm not alone. I will be watching for your new room to be revealed.